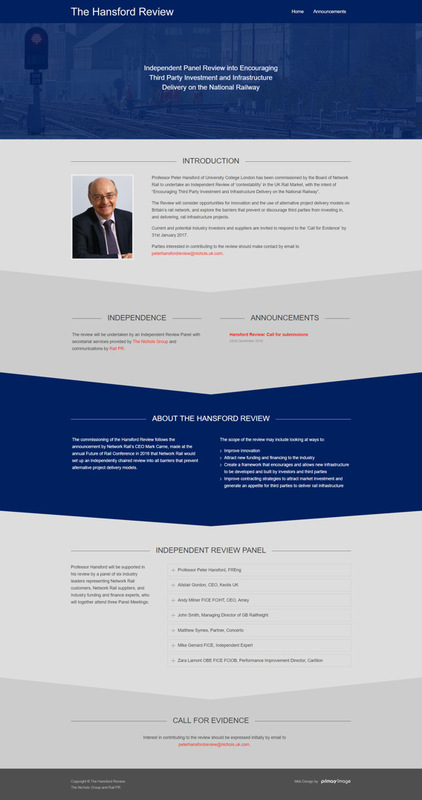 Primary Image was chosen to design the website for the Hansford Review, which is an independent review into Network Rail. 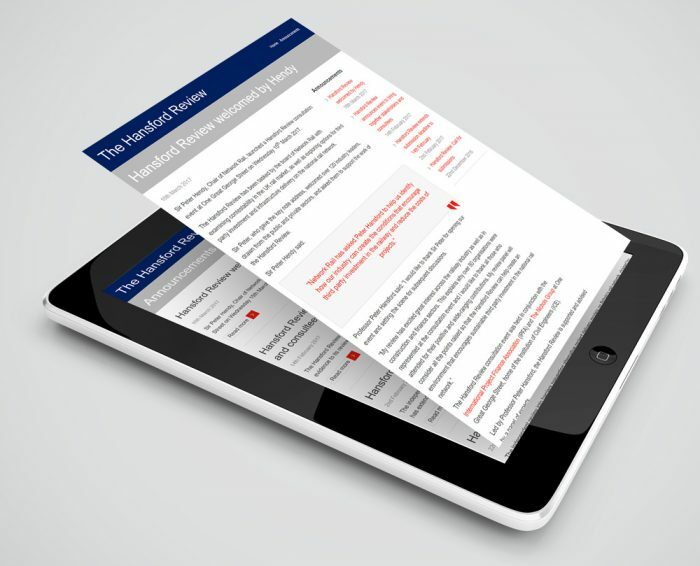 What is the Hansford Review? The Hansford Review was commissioned by the Network Rail board at the end of 2016, tasked with encouraging third-party involvement in infrastructure projects. The review is being undertaken by Professional Peter Hansford, who was recently Chief Construction Adviser to the government, with support from a board of six industry leaders. The review is being assisted by Rail PR and The Nichols Group, who are providing communications and secretariat services. The client purposely wanted a very simple, straightforward web design, that was clear and easy to read. The Hansford Review were using an existing logo, a simple text heading on a blue background, which was something they were keen to retain. This provided a basis for our design concept. After an initial chat, as the website needed to be launched quickly, they trusted Primary Image to create an appropriate style. Once we had received the text content, we got to work immediately and had the website ready to preview in under three days. Our web design uses a series of coloured blocks and columns, with a large clear typeface for the headings and content. Despite the simple design, the slanted shapes and blue/grey colour palette give it a modern, up-to-date look. We also utilised animated toggles on the home page, meaning visitors can expand the content to view further information. The website was extensively tested and proven to work perfectly on mobile devices, which is an essential requirement nowadays. For the home page, the website also makes use of railway photography provided by our in-house photo library. The website uses our easy-to-use editor software. The administrators of the Hansford Review can login and add news announcements quickly and easily. The editing screen prompts them for a headline, content and (if necessary) a publication date. The news listings on the home page and news index automatically update whenever a new news item is published. It’s also easy to change the home page content, using the Visual Composer editing system, which breaks the content into separate text blocks. Primary Image manages the technical upkeep of the website, which includes security, software updates, backups and giving technical support with using the when needed. As the rail industry’s leading web designers, if you need a website for your business or organisation, why not get in touch and see how we can help you?